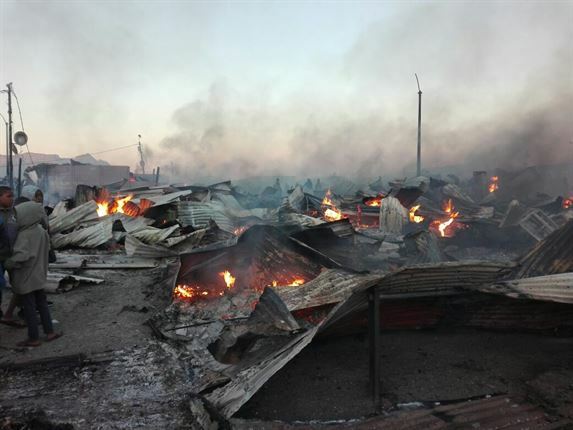 The MJC in conjunction with members of the Siddique Mosque in Elsies River is assisting more than 500 residents who lost all their possessions in a devastating fire in the 7de Laan informal settlement in Valhalla Park last year. The City of Cape Town assisted these families for 3 days after the fire, but to date, residents are still trying to find their feet. Two members of the Siddique Mosque in Elsies River, Mohammad Luddy and Muawiyah Sufyaan, have been assisting about 500 to 700 residents including children since Boxing Day with the rehabilitation of the fire victims. They approached the MJC to rally the community to assist their efforts as many people are struggling to recuperate after the fire burnt all their possessions. “With schools opening next week, we need to ensure that the children are fed and can concentrate on their school work. We implore the community to show mercy by assisting them at least until the end of the month with one hot meal a day,” Shaykh Abrahams concluded. Non-perishable items – e.g. Baked beans, tuna, dhal, lentils, sugar beans, Red speckled beans, jam, peanut butter, rice, spices. We also require toiletries – e.g. toothbrushes, toothpaste, soap and especially sanitary pads.